How can I help prepare my child for their first preventive appointment? Always use positive language when discussing the dentist’s office and what your child can expect – if you’re excited, they’ll be excited too! 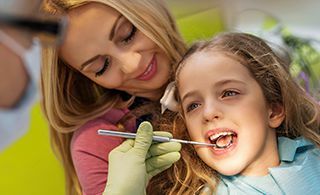 If your child is old enough, play “dentist” with them at home to help them become accustomed to what they’ll experience at our Prospect, KY practice. Have them sit back in a chair and ask them to open their mouth so you can peer in with a little flashlight. Then, switch places! Does your child have a favorite toy or blanket? Bringing that item with you can help provide them with a sense of familiar comfort in a brand-new setting. Don’t panic if your child becomes anxious or upset during their initial visit. New places and faces can be scary, and Dr. Danielle and the rest of our staff understand that very well. We’ll always be calm, patient, and ready to help. We can’t wait to welcome new patients from Green Spring, KY and surrounding areas! Contact us today to schedule your child’s first visit with Dr. Danielle, or if you have any questions our team can help you with.